Conor ‘Notorious’ McGregor is in Boston currently for St. Patrick’s Day. Last night Saturday (March 16, 2019) Irishman did the ceremonial puck drop for the Boston Bruins vs. Columbus Blue Jackets NHL hockey game at a TD Garden. 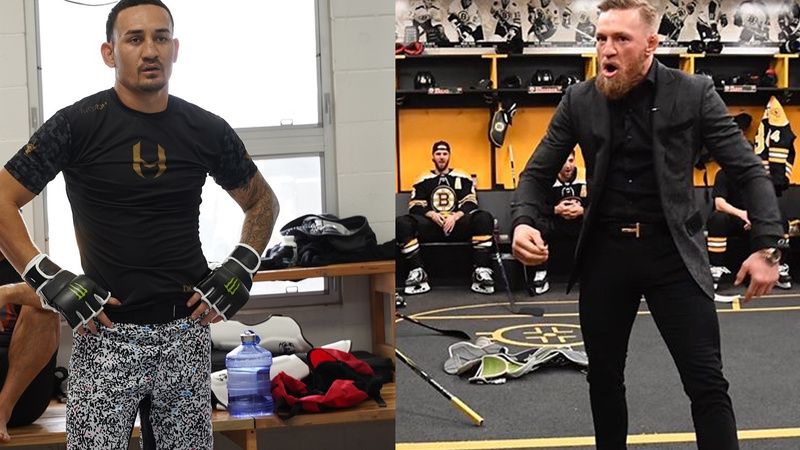 Before the game, Mcgregor made an appearance in the Boston Bruins’ locker room where he delivered a fiery speech. Earlier this week Mcgregor was arrested on two felony charges for stomping on fan’s cell phone outside Miami beach hotel, later he bailed out after paying off $12,500. To remind you it’s the same arena where McGregor scored a unanimous decision victory over Max Holloway at UFC Fight Night 26 back in 2013. On the wee hours of Saturday night, Mcgregor took to Twitter and reflected on his 2013 Boston victory over Max Holloway. Max Holloway acknowledged Mcgregor’s post and issued a scathing response in a multi-part Twitter roast. “But if we talking about the past remember this: I was 21. You were 25,” Holloway said, before matching his and Irishman’s achievements at the ages of 21 to 25. Holloway attached a link referring when McGregor suffered a loss from the hands of Joe Duffy when Irishman was only 21-year old. Featherweight champion Max Holloway is currently slated to take on Dustin Poirier for the interim lightweight title at UFC 236 on April 13, meanwhile, Conor Mcgregor is targeting a summer return. Who wants to see Holloway vs Mcgregor again?